Racked Tubes can be used as reaction vessels in robotic workstations or as a long term storage vessels in your sample library. Strip Caps for the tubes are also available. Tubes are made of autoclavable polypropylene and are available either individually or in strips of 8 or 12 detachable tubes. The tubes have a gross volume of 1.2mL but with a cap in place, they will hold 1.1mL. The 96-well footprint is ideal for mixing, vortesing, and storage of samples. 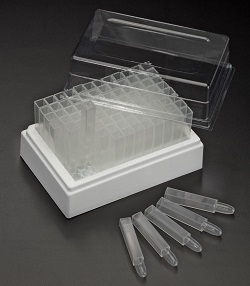 Rack contains 96 removable polypropylene square tubes in a 8 x 12 configuration, each having a 2.1 ml capacity (2 ml when capped). 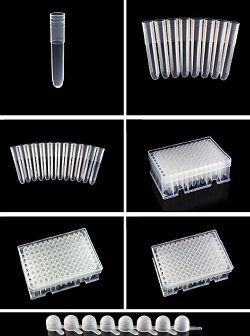 Although the tubes are square, the conical bottles are ideal for sample aspiration. Compatible with most robotic workstations, it can be used with most cell harvesters and leading 8- & 12-channel pipettors. Ideal for automation / HTS, storage, dilution, mixing, harvesting, culture assays, and screening.